Hmmmm, haven’t we seen these scenes before? Actually, more than you might have thought. You probably could’ve guessed Kevin VanDam had won more BASS tournaments than any other angler. But did you know Scott Martin had also won more FLW Tour events than anyone else? Well, the two were back at it again this weekend, both notching victories. After five years without a win, VanDam came from behind at the Bassmaster Elite at Cayuga Lake to win his second Major event in seven weeks. Meanwhile, Martin did what he does best, winning his third FLW Tour event at Lake Champlain. The victory was VanDam’s 22nd and Martin’s sixth, though those numbers don’t include their combined eight Angler of the Year titles or Martin’s FLW Series win (which would be considered a Major victory). Needless to say, both pros know how to win, and both have been ranked No. 1 in our Majors Ranking at one point. Though, one is closer to being No. 1 again than the other. Martin’s win has him ranked No. 2 overall, only behind the man who just took over his FLW Tour Angler of the Year crown, Andy Morgan (Morgan’s third AOY, for those counting). Meanwhile, VanDam has seen a massive resurgence up the rankings in the last two months. He nearly had fallen out of the top 100. Now? He’s ranked 56th. Still far from his former top ranking, but also much higher than before his Toledo Bend victory. You’d think after two events we’d see some serious shakeups at the top of the rankings like we did a couple weeks back, but that’s not the case this time. 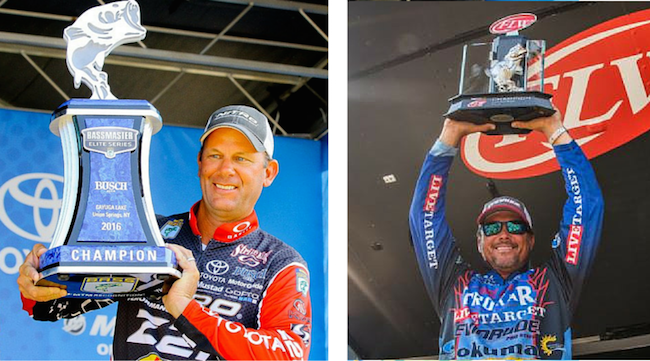 It seems every top-ranked angler did well this weekend. The biggest “slip” was Aaron Martens going from third to fifth. Hardly a big fall, but as we said before, there will be some big shake ups coming this week as some tournaments drop off, so make sure to check back.